Are your aging loved ones eating right? Spring has sprung and it’s a welcomed reminder about the importance of a balanced diet for aging family members. Statistics Canada writes that there are many risk factors that can affect older Canadians in meeting their nutritional requirements ranging from “age-related physiological changes such as diminished appetite and impaired senses,” to diseases and medications affecting digestion, to reduced mobility which could hinder the ability to go grocery shopping and prepare meals. Even financial factors and loneliness can affect the way aging adults choose to eat. So how can we make sure our loved ones are eating not just enough, but enough of the right stuff? Help with meal planning: Even for ourselves it may be a challenge to eat healthy and ensure we get all the right nutrients but as a caregiver, it’s even more important to set aside time to help aging adults plan their meals. For example, it might be hard to get them to swap in whole grains and lean meats but these changes are important for a balanced diet. Time permitting, you may even want to try making weekly calendars, menus, or lists that can be a visual meal reminder for seniors if they are living independently. Variety and making food fun again: Similarly to getting our kids to eat their greens, it can be a challenge to get elders to eat – period. As mentioned above, they’re likely losing sense of taste and their appetites but introducing new meals or variations might just do the trick. Tech tip: If it isn’t already, Pintrest will be your new best friend. 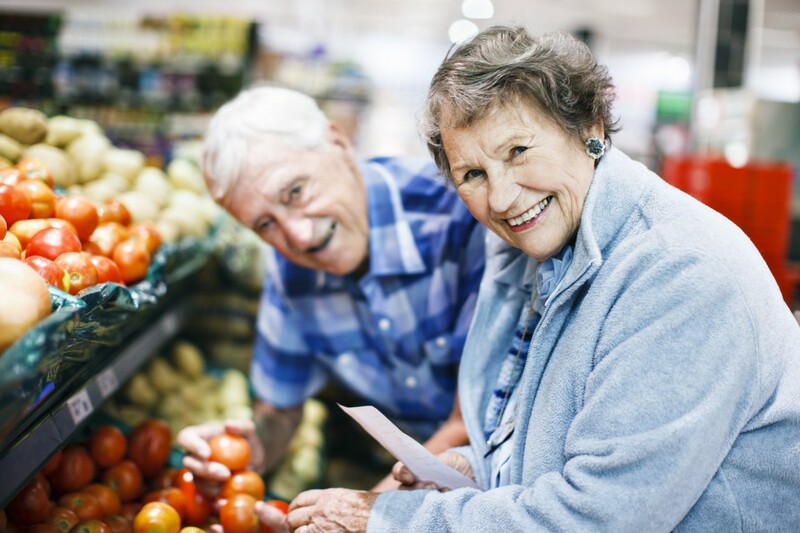 Grocery assistance: Again, as mentioned earlier, sometimes seniors aren’t able to eat properly because they physically can’t get the items they need. Canned foods can get heavy, grocery stores are becoming massive labyrinths, and food labels are getting more and more confusing. Taking your family members to the grocery store and directing them to the right foods can be more helpful that you realize. And we can’t forget about Canada’s Food Guide suggestions. Adults over 51 should be getting seven servings of fruits and vegetables, six to seven servings of grains, three servings of milk and alternatives and two to three servings of meat and alternatives a day. An easy way to reach this nutritional goal is dividing the space on their plates: about half should be filled with fruits and vegetables, a quarter with proteins and a quarter with grains. Canada’s Food Guide is available for you and your family to view online and to print – and in a variety of translated languages. Visit Health Canada for more information.